(February 8, 2019) – Lionsbridge FC announced the addition of a marquee opponent to its 2019 schedule. 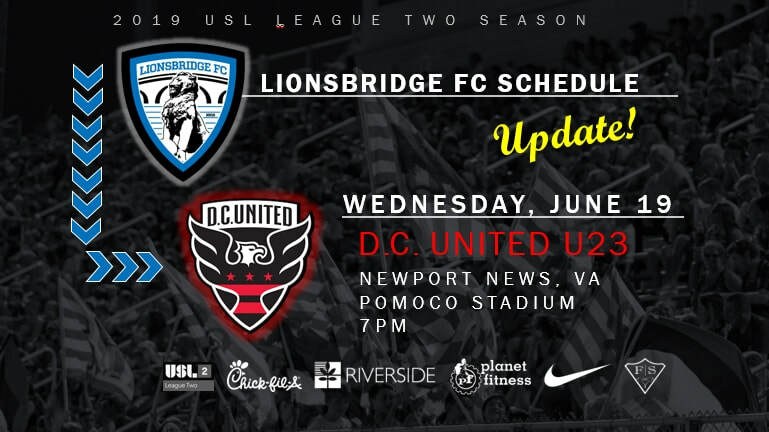 For the second straight season, the Lions will host the Under-23 squad from the storied Major League Soccer franchise, D.C. United, at Pomoco Stadium on Wednesday, June 19. The pre-game festival will begin at 5 p.m. with food trucks, a beer garden, bounce houses and other family-friendly activities. The game will begin at 7 p.m.
Lionsbridge FC Season Ticket Jerseys and Wristbands are available now for purchase. Single game tickets will go on sale in April. BUY SEASON TICKET WRISTBANDS OR JERSEYS! D.C. United U23 is part of the D.C. United Academy. Notable products include Bill Hamid, goalkeeper for the US National Team and the D.C. United first team, and Andy Najar, Honduran national team player currently with Belgian First Division A club R.S.C. Anderlecht. Graduates of the D.C. United Academy have signed professional contracts in the U.S., Israel, Belgium, Sweden and play for multiple other national teams, including Jamaica and Ethiopia. Lionsbridge FC defeated D.C. United U23, 4-0, in the 2018 season finale at Pomoco Stadium. A crowd of 1,636 fans saw Travis Cooke (Chesapeake) score a pair of first half goals. Sebastian Gunbeyi (Virginia Beach) and Shaun Russell (Virginia Beach) both added second half tallies. Goalkeepers Joe Rice (Fairfax) and Sean Stowe (Midlothian) combined to keep a clean sheet. ​​Lionsbridge FC will begin its 2019 season with a Spring Festival on Saturday, April 13 at York High School’s Bailey Field. The event will begin at 5 p.m. with a youth clinic, community festival and exhibition game vs. Chowan University. The regular season slate begins with three road games before the team returns to Pomoco Stadium for the home opener on Wednesday, May 22 against Virginia Beach United, the first of three matches against the new Hampton Roads rival. Additional home dates against USL League Two opponents are set for May 25 (Wake FC), June 1 (North Carolina FC U23), June 15 (Tobacco Road FC), June 22 (Carolina Dynamo), June 26 (Virginia Beach United), July 3 (Tri-Cities FC). Lionsbridge FC will announce additional matches against non-league opponents in the coming weeks. Lionsbridge FC will play in the highly-competitive, seven-team South Atlantic Division of USL League Two. Last year, the Lions finished in third place and took points off every opponent except one in a division that featured a combined 121 NCAA Division I players and 4 MLS draft picks.